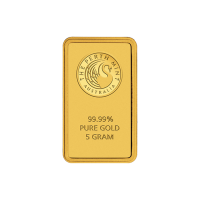 Kangaroo Minted Gold Bars are meticulously "struck" from 9999 pure gold. 각각의 주조된 골드바는 앞쪽에 조폐국의 구분되는 로고-위엄있는 백조-를 나타냅니다. The back of each bar is decorated with kangaroo motifs, symbols of the Australian "outback" where gold has been mined in commercial quantities since 1851. 퍼스 조폐국 금 웨이퍼바 5g Kangaroo Minted Gold Bars are meticulously "struck" from 9999 pure gold. 각각의 주조된 골드바는 앞쪽에 조폐국의 구분되는 로고-위엄있는 백조-를 나타냅니다. The back of each bar is decorated with kangaroo motifs, symbols of the Australian "outback" where gold has been mined in commercial quantities since 1851.